A Block away from Stadium SkyTrain Station. Steps away from BC Place Stadium, Rogers Arena and Queen Elizabeth Theatre. Meeting & banquet facilities. 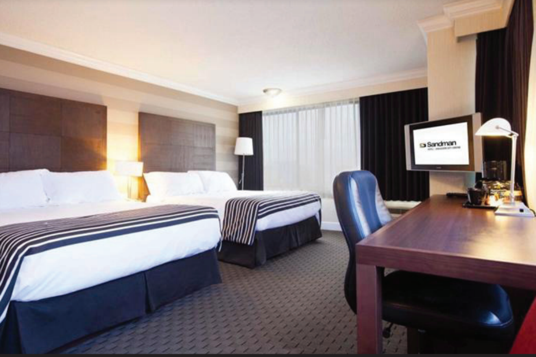 Our Corporate Tower & North Tower consist of 303 Comfortable guestrooms, kitchenettes and executive suites. Featuring Fiber Optic Internet service. On-site restaurants: Moxie’s Classic Grill, Mbar Lounge and Shark Club Bar & Grill. In-door swimming pool, fitness centre, gated underground parking. Steps away from open-space parking lot for large buses and coaches. YOU MUST BOOK BY September 19th, 2018 TO RECEIVE THIS RATE. 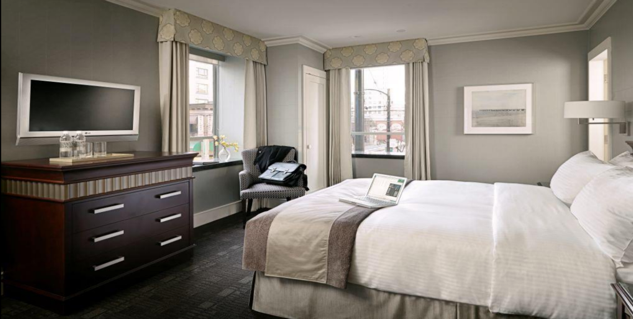 With 65 guestrooms, the St. Regis Hotel’s sleek interior design and crisp tailored look creates a perfect atmosphere for the discerning traveller. The St. Regis Hotel is a 100% Canadian owned and operated boutique heritage hotel, located within Vancouver’s central business district which is within walking distance from Robson Street, UBC Robson Square, BCIT, SFU, the Convention Centres, Pacific Centre mall, Holt Renfrew and acclaimed restaurants such as the on-site Gotham Steakhouse and Cocktail Bar. We even have a Starbucks on-site! The St. Regis Hotel is TripAdvisor’s Travellers’ Choice Award recipients for 2017. Amenities and services at the St. Regis Hotel include 32” - 50” LCD TVs with multi-media hubs, cordless phones with data port, L’Occitane En Provence amenities, terry bath robes, oversized in-room safes and coffee makers. The rate of $239.00 is available for reservations between Thursday, October 18th and Sunday October 21st, 2018. Please call the hotel directly to book your room. 604-377-021. You can also email jthomas@stregishotel.com. Referto the Group name "ABCDE Fall Conference” when making reservations. To get this rate you must book your room before September 19th, 2018 to receive this rate. After this date you will be offered rooms at the Best Available Rate.